Note: The Canon RC-5 Wireless Remote has been replaced by the Canon RC-6 Wireless Remote. Measuring only .25" x 1.25 x 2.5" (6.5 x 32 x 63.5mm), the Canon RC-5 Wireless Remote easily fits in even a small pocket. The RC-5 will only operate in a 2-second delay mode. Because the newer Canon RC-6 Wireless Remote Controller is the same size, the same price and allows you to choose between taking an immediate shot and using the 2-second delay, I recommend you purchase the RC-6 (or the Canon RC-1 Wireless Remote instead. Point the Canon RC-5 Wireless Remote toward the front of the camera (line of sight only) within 16' (5m) and take the shot when you are ready. Using a wireless remote release eliminates camera motion related to pressing the shutter release - and allows you to be a subject in your photo. Being able to stay near your subject to assist in composition (or ease stress) is another benefit. The RC-5 may also be used to activate mirror-lock and bulb-shutter functions. 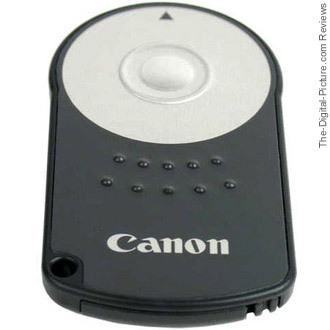 The Canon RC-5 Wireless Remote is powered by 2 CR-1220 Lithium button batteries. It is a very useful device - but again, get the Canon RC-6 Wireless Remote Controller instead.